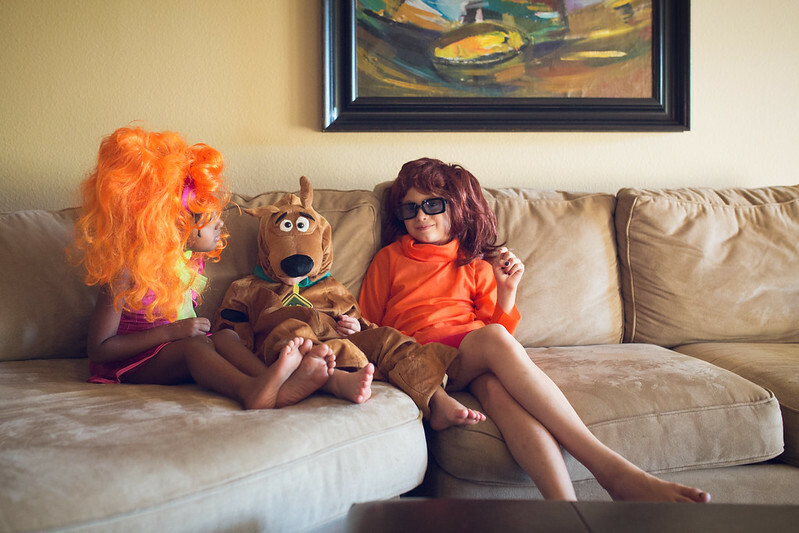 So the kids thought it would be a great idea to have a Scooby Doo party for Iris' birthday. 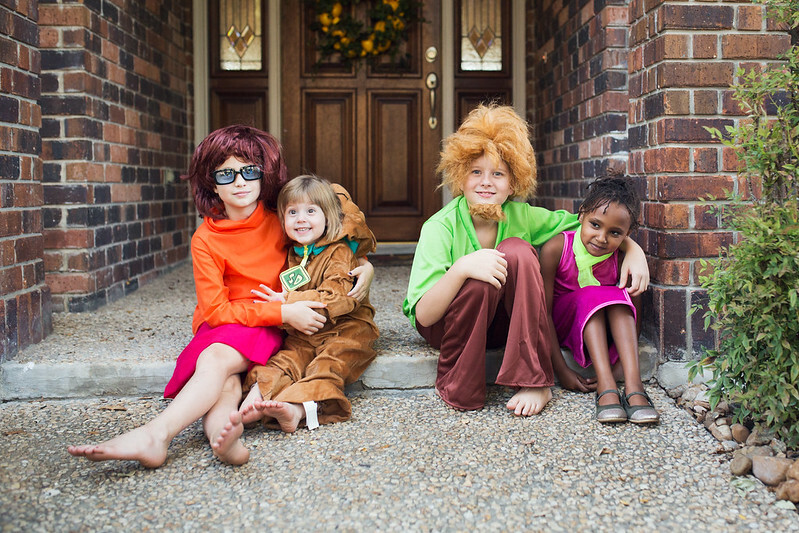 Not just any party, though, a Scooby costume party. 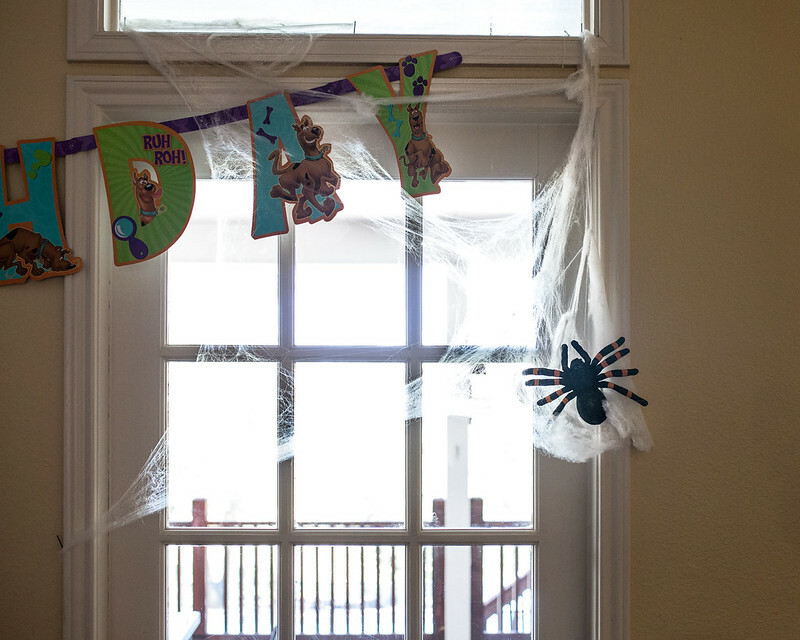 The brainstorming continued and they decided that we must also decorate our house to make it like a Scooby Doo haunted house. 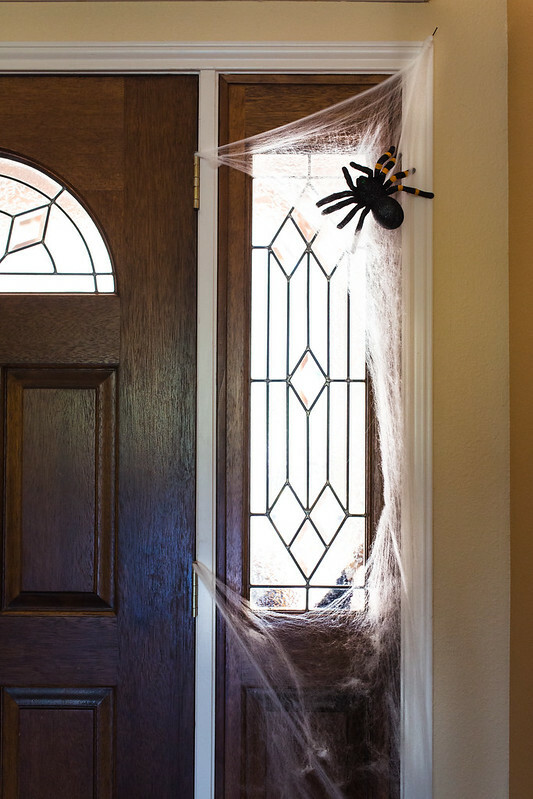 We don't like to do anything too creepy so we stuck with cobwebs and spiders. It worked out great with Halloween right around the corner. They'll wear the costumes again then and we'll also leave up all those decorations, too. Dual-purpose. I like it! I didn't make any of their costumes this year. I went all out last year, so I took this year off. :) These costumes all came from Amazon. 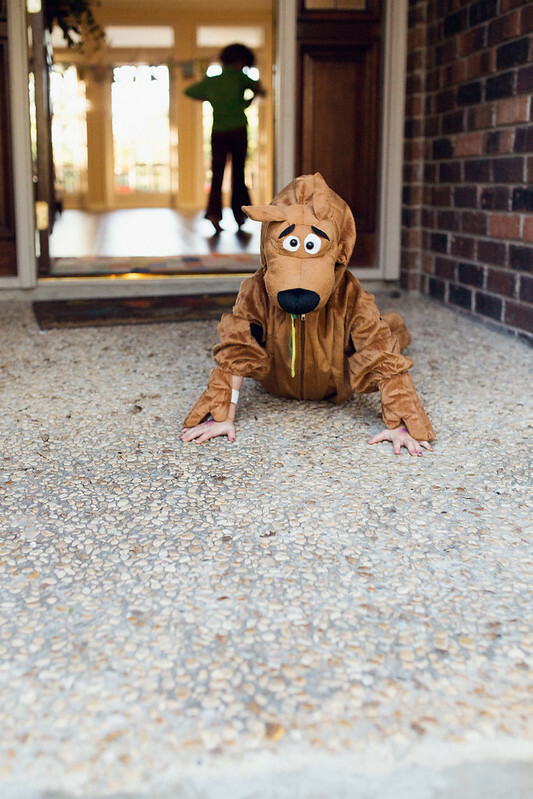 Iris took her role as Scooby veeery seriously. Dan's brother, Josh, was in Texas on a business trip. He rented a car and drove two hours out of his way to see us! 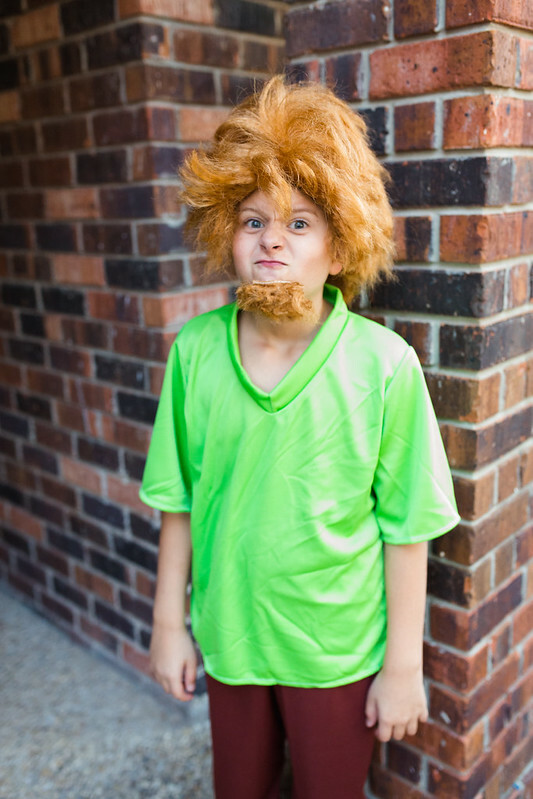 Not only was he game for dressing up as a Scooby character, but he also jumped right in to help with the party. He made hamburgers and grilled with Dan. 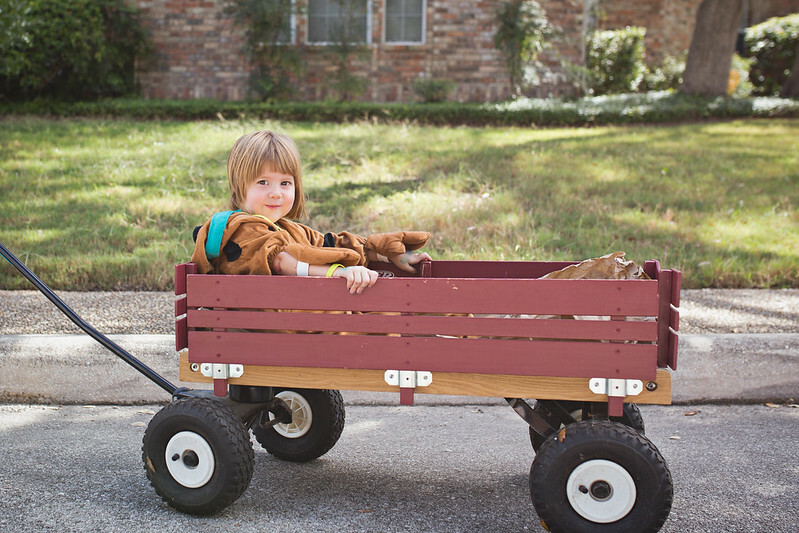 He played pin the tag on Scooby with the kids as well as Hide-and-Seek. He let Iris stamp him with her Scooby stamps. He talked legos and model airplanes with Jude. He's an engineer and has his pilot's license. Not only can he fly planes but he has even built one! Jude was totally in awe of him. We all enjoyed seeing Josh so much! He is such a great person and it's so fun to see Dan and him together. They're both so witty - I think I was laughing most of the time! 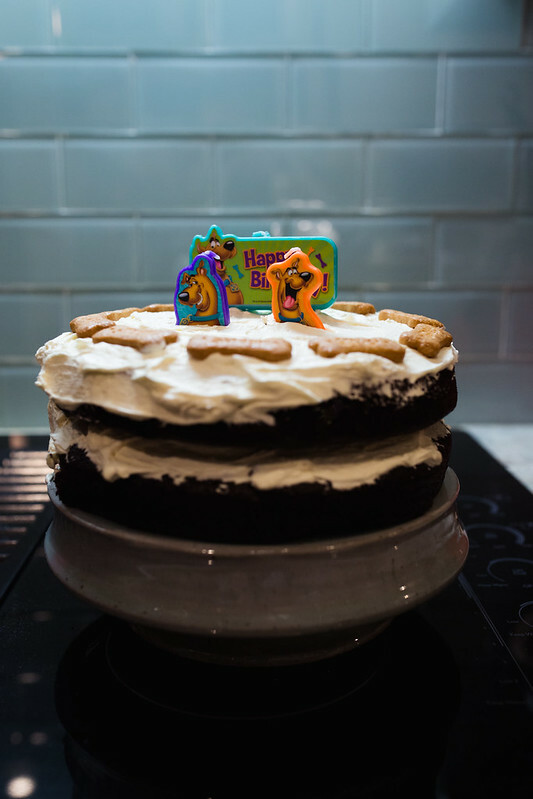 The kids and I have a tradition of frosting the cake right before we sing Happy Birthday. The birthday kid and I make the frosting together. It's something they really love and look forward to, even though it's such a small thing. 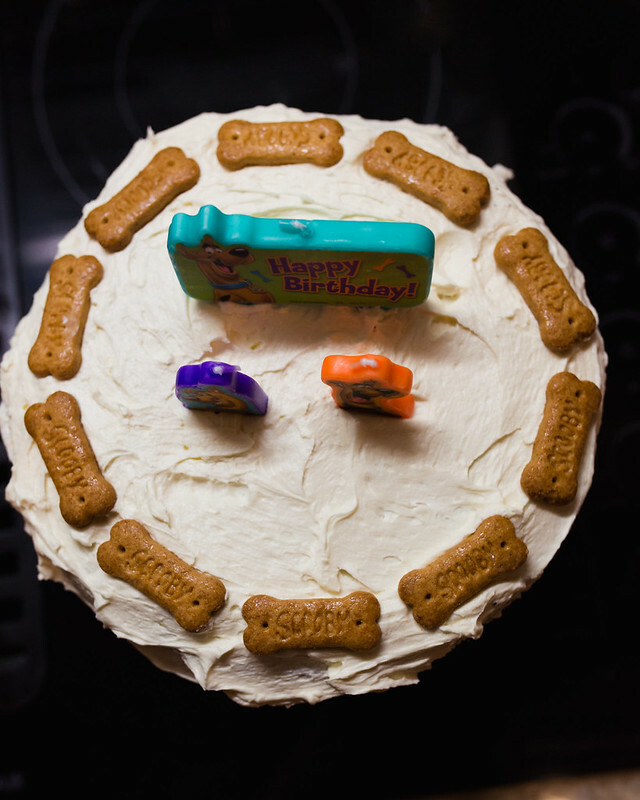 It ended up getting late on Iris' birthday so we asked if she wanted to do her cake the next day. Which, of course meant the party would continue for one more day. She liked that idea. 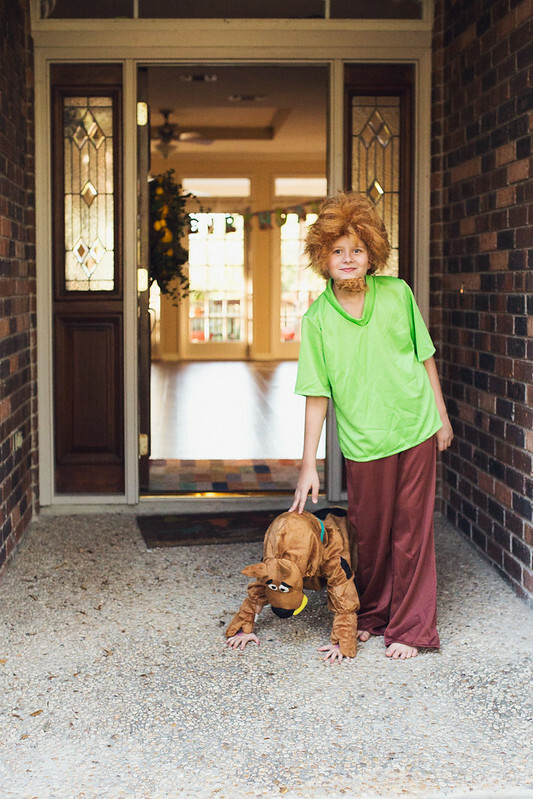 The next day she wore her Scooby costume the entire day. It was so cute. Then we finally frosted that cake. While we were making the frosting, Iris accidentally spilled vanilla on her Scooby costume, so she put on a sparkly headband and called it good. Of course, we did have to wash the costume immediately so she could wear it again the following day. 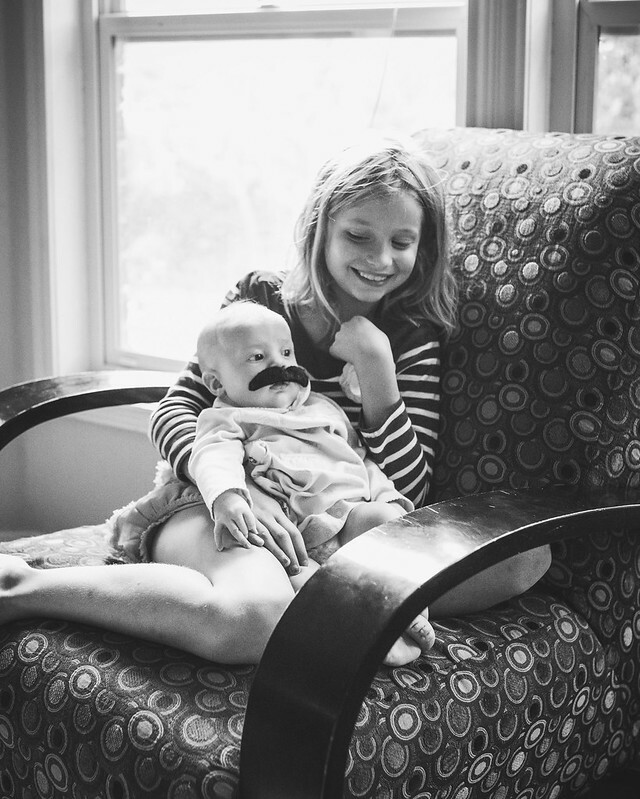 While I took this photo of Iris, Indigo put her mustache on Hazel. It reminded me of this. I can easyly imagine how this moment was special and fun ! Happy birthday to your little Scooby-clown (I'm still laughing while having my breakfast). Ha ha, what an awesome party. And what a lovely addiction! Something different than a Frozen party, isn't it :-) Norah also has these periods where she's completely addicted to something (currently: Little Red Riding Hood). I love this party! 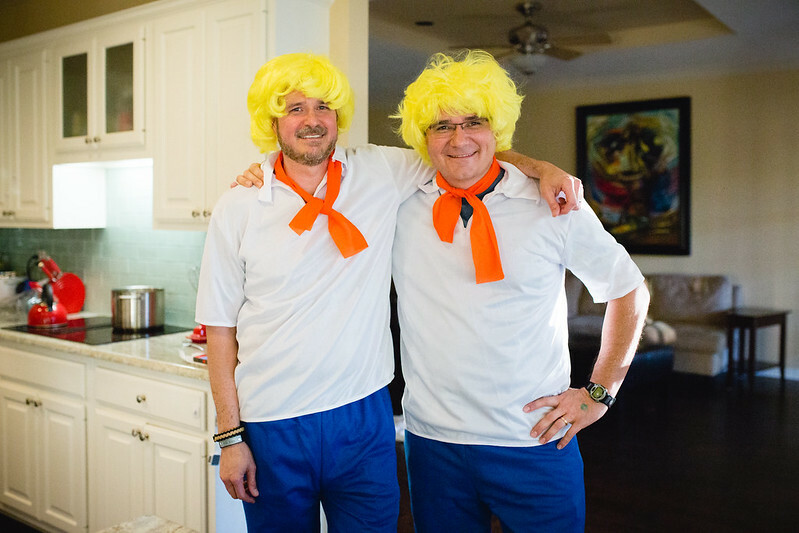 How fun are those costumes! 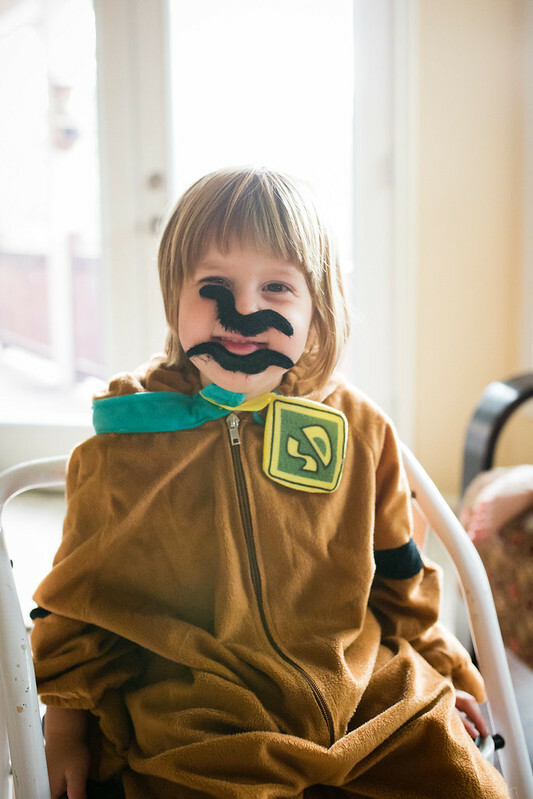 Iris as scooby is so funny. especially on those pics were you can't actually see her. amazing! Happy birthday Iris!! :) They all look so cutee. Oh, and Indigo always look so loving! What a fun party! I love all the planning that went into it. And party costumes that double as Halloween costumes- that is very handy! I'm deep in Halloween sewing right now. Next year I may take the Amazon route! AAAAAAAAAAAAAAAAAAAAAAAAAAAAH. Cute overload!! Seriously, this much sweetness should be ILLEGAL. I can't take it! 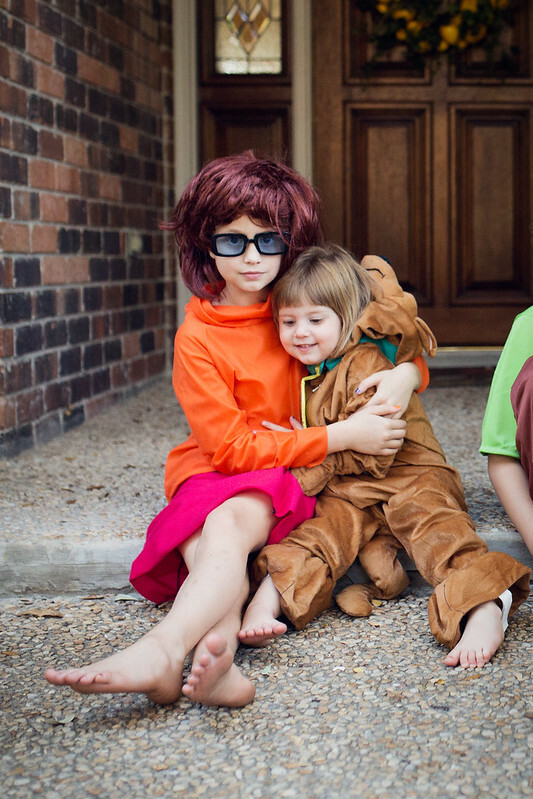 I love the Scooby costumes! And the mustaches! Oh, so much sweetness here. What a fun party!!! 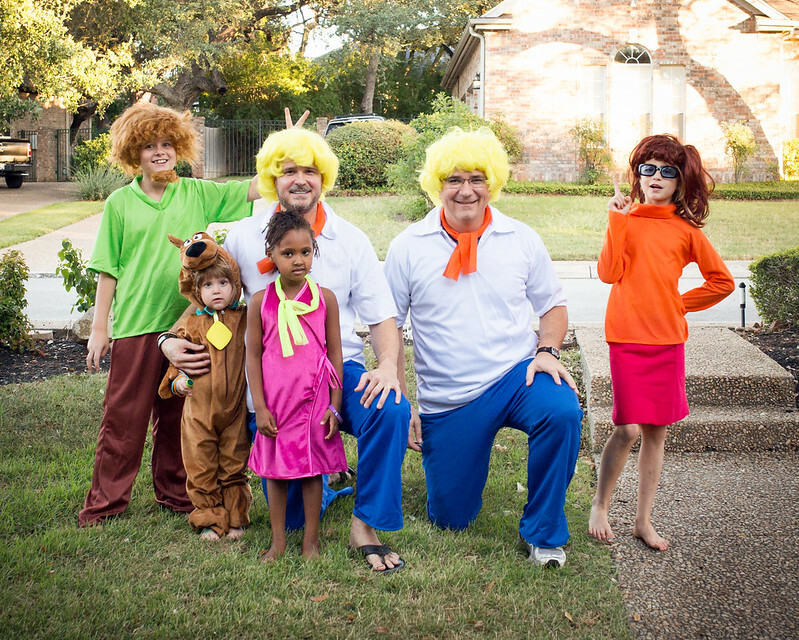 We talked about using the Scooby Doo characters as our nieces' costumes this year....but opted to postpone that for a while. ahhhh such joy! and amazing photos of a fun birthday. Happy birthday, Iris! 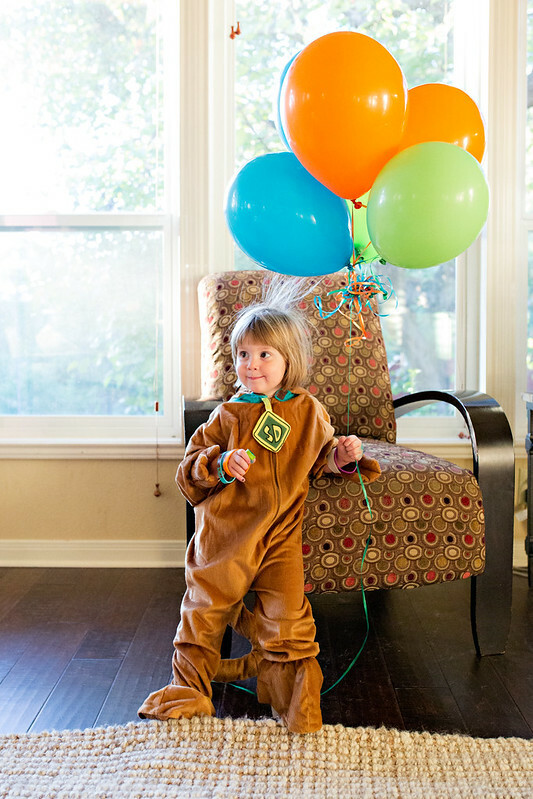 This is possibly the cutest party ever - particularly since it was such a family affair! I love how everyone was involved, especially Dan's brother. That picture of the two of them together is priceless! What a wonderful birthday party! 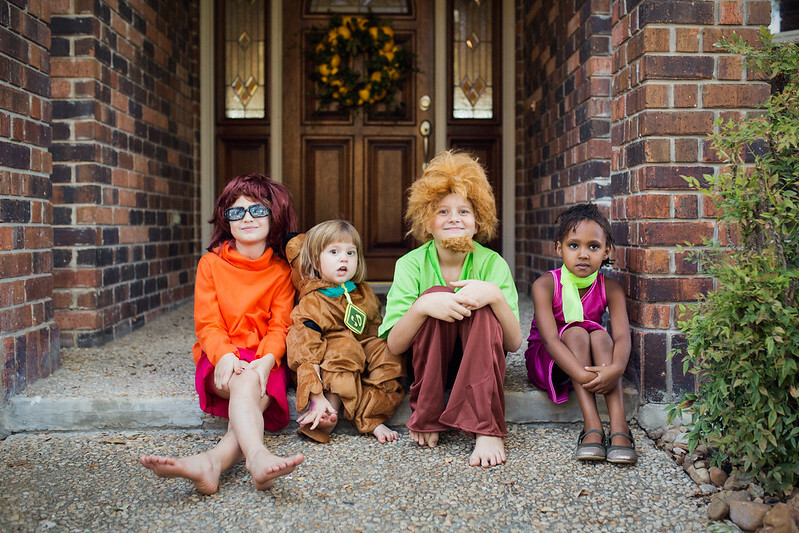 You've got the cutest Scooby Gang, and Iris is adorable as Scooby Doo. Happy Birthday, Iris! couldn't let this post go by without saying HAPPY BIRTHDAY IRIS!! such a cute party and love everyone in costume. This party planning pro is amazing! She makes you feel like you're her only client, even though I know she's booked. She helped plan our entire wedding, from finding the venue to recommending all the vendors to running the rehearsal.